This large size (26 inches high or more) cultivar was registered by Connie Williams, the daughter of Frances Williams of Massachusetts in 1986. It was "discovered" in a Connecticut nursery in 1936 by Frances and is considered a sport of H. 'Elegans'. This cultivar was once known as H. sieblodiana 'Aureomarginata' before being renamed. The leaves have thick substance, are heavily corrugated, have a deeply lobed base and a distinct tip. It bears large clusters of near white flowers from mid-June into July. Unfortunately, this cultivar is susceptible to spring desiccation burn (see below). According to The Hostapedia by Mark Zilis (2009), this cultivar "...is named for the most influential person in the modern history of hostas. Her correspondence with other collectors, hybridizers, and botanists from the 1930s until her death in 1969 fanned the flames of interest in hostas and let to the formation of The American Hosta Society. She also developed some of the first hosta cultivars including 'Green Piecrust', 'Louisa', 'Sweet Susan' and 'Frances Williams'." 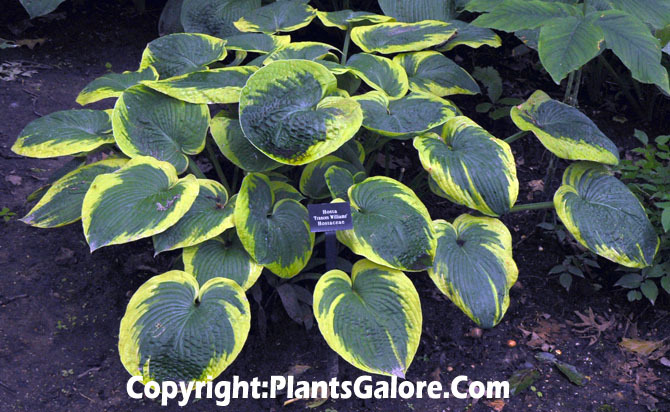 The New Encyclopedia of Hostasby Diana Grenfell (2009) states: "Site in light to moderate shade to prevent the leaf edges from scorching, but they will scorch in the warmest climates even in full shade. Impressive in a large container but needs dividing every three years...Slow to establish but nonetheless among the most popular hosta ever introduced. Breeding whit this cultivar often produces streaked offspring." This cultivar has been awarded the Royal Horticultural Society's Award of Garden Merit in the UK. It was the Winner of the 1986 Alex J. Summers Distinguished Merit Hosta Award. It may have been sold at one time as Mackwoods No. 19. An article by W. George Schmid in The Hosta Journal (1985 Vol. 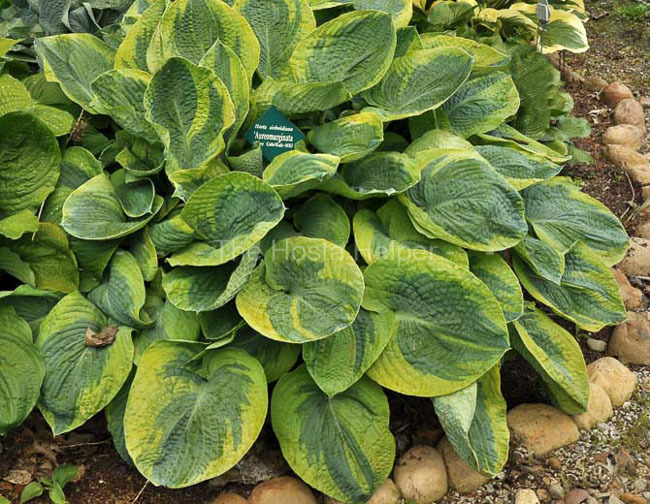 16) says that, "The other German hosta of great interest is H. 'Semperaurea'...it is the most magnificent golden-leaved hosta I have seen...said to have come from Japan in the 1930's, and, therefore, there would have existed a golden-margined form of H. 'Sieboldiana' -- which we now call H. 'Frances Williams' -- in Japan during that time." Alex Summers in The Hosta Journal (1995 Vol. 26 No. 2) writes, "H. 'Frances Williams' was registered...without detailed description or photos...the plant was discovered in 1936 by Mrs. Frances Williams...in rows of H. 'Elegans' at Bristol Nurseries in Bristol, Connecticut...Frances Williams sent a division to the University Botanic Garden in Oxford, England in 1959. It was named by George Robinson at a Royal Horticultural Society lecture on variegated plants." A second article by Alex Summers in The Hosta Journal (1995 Vol. 26 No. 2) was titled, "Hosta 'Frances Williams': A New Look at an Old Favorite". The main premise of the piece was that over the long history of H. 'Frances Williams' which was discovered in 1936, the plant sold by that name in recent decades is actually H. 'Aurora Borealis'. He claimed to have a clump of the original Williams' plant which he named 'Bristol Frances Williams' to indicate that it is the one found by Frances Williams in 1936 at a nursery in Bristol, CT. The plant known as H. 'Aurora Borealis' came from a hosta that Chet Tompkins' mother, Cynthia received from England in 1924 and later named by Thelma Rudolph of Illinois according to Summers. An article about H. 'Great Expectations' written by Warren I. Pollock in The Hosta Journal (2000 Vol. 31 No. 1) reports that the originator, John Bond of England, wrote, "I became aware of an obvious sport on a substantial clump of H. 'Elegans' ...in the rhododendron species collection in the Valley Gardens in Windsor Great Park during the early 1980s. After a year or so I decided to remove this sport for it was clearly promising to say the least...The three "cuttings" were carefully planted in a sheltered corner of my own garden...The following spring produced three nice little plants...Rightly or wrongly I gave Paul Aden [Baldwin, New York] one of my plants and the remaining two were transferred to the Savill Garden from where sadly they were both stolen!...So that is the very simple story and explains that there was no mysterious breeding programme and also that H. 'Frances Williams' had no part to play." While there are fewer yellow-margined hostas, there are still some timeless beauties. H. 'Abiqua Moonbeam' is the green-centered sport of H. 'August Moon' and surely shines in the garden. H. 'Alvatine Taylor' is a large blue-leaved hosta with gold margins that don't exhibit the characteristic burning of gold-leaved forms of H. 'Sieboldiana'. H. 'Aurora Borealis' is one of the many similar cultivars in this group. H. 'Frances Williams' has been one of the most imitated of the classic hostas, after all she was the first of over a dozen named, similar gold-margined sports from H. 'Elegans' . Each one is reported to be an improvement. Claims include not burning as much on the gold portion of the leaf, improved flowering or showier variegation. In any case, it is difficult to distinguish these cultivars. H. 'Carnival' is a Lachman hybrid which features dark-green leaves and wide irregular gold margins. H. 'Don Stevens' has pointed green leaves with creamy-yellow margins. H. 'Fortunei Aureomarginata' is an oldie that still is not to be outdone with its dark-green leaves and golden margins. H. 'Golden Tiara' has produced a whole series of sports, as previously noted, one of which is H. 'Grand Tiara' with wider gold margins. H. 'Grand Tiara' also has produced a whole series of sports. The Tiaras all have a fine display of light-purple flowers that may re-bloom if deadheaded. H. 'Green Gold' is one of the early gold-margined hostas. H. montana 'Aureomarginata' - as showy as it gets! H. 'Radiant Edger' is a dense sport of H. 'Gold Edger' has an attractive blend of green with gold. H. 'Tokudama Flavocircinalis' is the gold-margined sport of H. 'Tokudama' and while not as large as H. 'Frances Williams', doesn't exhibit the typical burning of the gold margins. H. 'Sum and Substance' : Needs brighter yellow foliage, more rigid scape. H. 'Sagae': Very slow to finish in pots; takes two seasons to get a good edge. H. 'Great Expectations' : Great in open shade or morning sun but hates dark shade. H. 'June': Slow to look mature in containers and in the ground. H. 'Paul's Glory': Very difficult to get to come true in tissue culture. H. 'Guacamole': Better foliage color contrast needed. H. 'Patriot' : Needs to finish off in containers faster. H. 'Gold Standard' : Yellow color could emerge and stay brighter. H. 'Regal Splendor': Takes several seasons to develop a nice wide edge. H. 'Frances Williams' : Foliage burns. H. 'Blue Angel' : Foliage could be much bluer and hold color. H. 'Krossa Regal': Needs shorter and more attractive scape. H. 'Fragrant Bouquet': Foliage color combination has little market appeal. H. 'Whirlwind': Central leaf color fades. H. 'Love Pat': Could be faster-growing. H. 'Halcyon' : Could be faster-growing. H. 'Sun Power' : O.K. as is. H. 'Inniswood': Could be faster to marketable-size finish crop. H. 'Striptease': Needs to be more stable. H. 'On Stage': Leaf color could hold longer; slow in containers. H. 'Spilt Milk': Leaf pattern could be more vivid, and it grows slowly. H. 'Fire and Ice': Could be more vigorous. H. 'Pandora's Box': Needs more heat-tolerance. H. 'Elegans': Needs bluer foliage that lasts into the summer. A Photo Essay by Steve Chamberlain in The Hosta Journal (2010 Vol. 41 No. 1) makes comments about H. 'Jack of Diamonds', "Robert Savory registered this H. 'Sieboldiana' hybrid in 1985. Although smaller in both leaf size and ultimate clump size than 'Frances Williams', it shows all the desirable qualities of this famous cultivar." Large, blue-green hostas with a gold/yellow marginal variegation such as H. 'Frances Williams', a medial (center) variegation like H. 'Brother Stefan' or yellow/gold leaf H. seiboldiana related cultivars such as H. 'Golden Sunburst' can make very attractive statements in the garden. 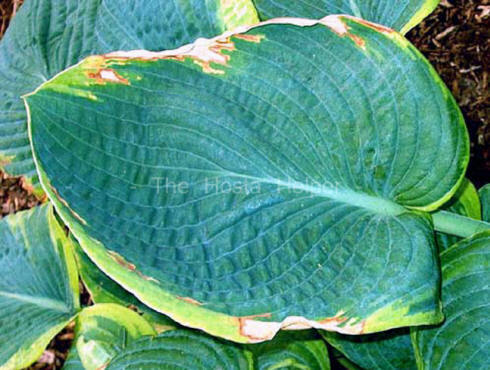 Unfortunately, some of this type of hosta suffer from a physiological disorder called "spring desiccation burn". For some reason, these plants often sustain discoloration and damage to the gold/yellow variegated margin or center of the leaf. Although this does not kill the plant, it does make it unattractive looking later in the season. We have accumulated sample lists of similar size and color cultivars noted as being Resistant or Susceptible to spring desiccation burn.